Earaches are a fairly common childhood ailment, one that you can probably take care of at home with natural remedies. You don’t have to run to the doctor if you use some of these home remedies to take care of your child’s earache, and if you have the ingredients at hand, you won’t even need to leave the house. Your child will appreciate the gentleness of the treatment, your budget won’t take a hit, and you’ll be better prepared for the next time one of your kids starts rubbing their ear and complaining about the pain. Use astringent herbs to irrigate the ear – Simmer 1/4 cup dried witch hazel leaves and 1/4 cup of dried comfrey leaves in 2 cups of water for 5 minutes. 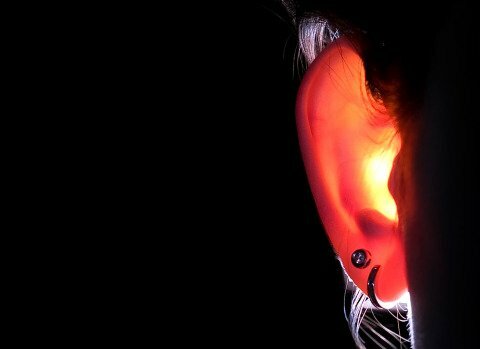 Let cool, strain, and irrigate the ear with an ear bulb (ear syringe): Lean over the sink with the sore ear down and gently flood the ear with the solution. Do not squeeze the bulb forcefully. Repeat the ear irrigation up to four times a day. Use healing herbs to irrigate the ear – Simmer 1/4 cup echinacea root, 1/4 cup dried mullein leaves, and 1/4 cup dried comfrey leaves in 2 cups of water for 5 minutes. Cool, strain, and irrigate the ear as above four times a day. Alternate the different herb mixtures as desired. Use a neti pot to irrigate the sinuses – A warm salt water solution helps the sinuses to drain, relieving the sinus and ear pressure. Warm garlic oil drops in the ear – Heat 1/4 cup olive oil just until warm (remember, ears are sensitive). Add 2 or 3 cloves of crushed or pressed garlic and let sit for fifteen to thirty minutes, then strain. Lie on your side with the affected ear up, and pour in a small amount of warm garlic oil. Leave the garlic oil in the ear for at least 10 minutes (longer is better), repeating up to three or four times per day. Warm clove oil drops in the ear – Instead of garlic, use a tablespoon of crushed cloves and follow the instructions above. Ginger and sesame oil drops in the ear – Grate one tablespoon of fresh ginger root into 1/4 cup warm sesame oil, prepare as with garlic and clove oil. Warm poultices on the ear – Dip a washcloth in hot water and place over the ear and side of the neck to relieve acute pain. Keep dipping the cloth in the hot water when cool and replace it on the ear. A popular folk remedy is to add 1/2 cup of chopped onion to the hot water before applying the washcloth. Ice pack on the ear – Alternate cold compresses or ice packs with the hot poultices. Apply the ice for a shorter time than the warm poultice. Lavender or tea tree oil – Put two to three drops on a cotton ball and place in the outer ear, leaving it for as long as is comfortable. Do not push the cotton ball into the ear canal. Apply lavender oil externally behind and below the ear. Gargle with warm salt water – Add 1/4 teaspoon salt to a cup of warm water, stir until dissolved, and then gargle with it (spitting it out afterward) until all of the solution is gone. Repeat three to four times per day. Take a hot bath – A hot bath does wonders when nothing else helps. Use an ear candle – Skeptics will scoff, but many people swear by them. Ask for instructions at a natural foods store or from your herbalist. Stand on your head – Being inverted helps ease some ear and sinus pressure issues and facilitates drainage of the Eustachian tubes. Take care of the rest of your body – Boost your immune system with echinacea, osha, astragalus, or your favorite tonic herb, taken internally. Drink plenty of water and fresh fruit juice, cut out the sweets and any possible allergens (wheat, dairy, soy, etc.) from your diet. Take some extra vitamin C. I think EmergenC is a great way to get your C and help with hydration. These natural earache remedies work great for adults as well! ← Circumcision: Will You Make the Cut? I get blocked ears regularly, and used to get them syringed by doctors – a problem if the doctor doesn’t do it properly, as sometimes happens, and leaves water in there, esp non-sterilized water. I now do it myself when needed, about 6-monthly. I just use a big plastic syringe (50 or 60 ml – always plastic as it’s less likely to do damage), and boiled water that’s been left to cool down to body temperature (should feel warm, not hot). A good strong squeeze of water, maybe 3 times, moving it around till I’ve got the right angle, does the trick. Doing this whenever it gets clogged has greatly reduced my ear infections. Syringing may not qualify as natural treatment in some people’s books, but it’s drug-free, and it’s good to have clean ears. Use common sense of course – this is not medical advice, just my experience, and your ears will be different to mine! You left out one of the best ones, onion juice or compress. An herbalist friend of mine recommends that if there’s any chance of infection you’re better off not putting oil in the ear, as healing as garlic oil can be. Just as healing and a little safer because it won’t coat the ear canal is onion juice. Bake an onion with the skin on until soft. Or if you have a microwave you can cut it in half, wrap in a damp rag or paper towels and nuke it, but I’m not much of a nuker. Apparently people still get relief though, so I guess it’s not destroying all the beneficial properties. When cooked, cut in half and squeeze out the juice, adding a little water if necessary to get juice out. Use a dropper and put about 2-4 drops in the ear. You can also use half of a warm onion over the ear to provide relief. Another natural remedy for ear problems that I’ve heard is to lie on your side and put a small amount of hydrogen peroxide in the ear for a minute or so (sounds like the ocean), but some experts say that may not be safe because it can be unstable. Who knows. .-= Chris @ Earth Friendly Goodies´s last blog ..Vita-Myr: A Natural Gum Disease Treatment and Bad Breath Banisher =-. As Rachel suggested I use onion juice as well and it did the trick on my youngest. Though I grate the onion, then squeeze out the juice. You only need a few drops. This way it is fresh onion juice, not cooked. .-= Adam´s last blog ..Halloween History =-. Some great natural home remedies listed here. Thank you for sharing. I have heard of some but others I did not know about. I will surely pass on this information to our daughter because her little 2 year old is prone to ear infections. I have tried the ear candles before myself and I can say that I really liked using them. This approach seemed to help “clear my head” would be the easiest way to put it. Thanks again for another informative post. I truly enjoy reading through your helpful suggestions on this site. Melaleuca Oil (Tea Tree) has worked wonders for my family. Any time we have an earache or suspect and ear infection we just but two drops of Tea Tree on a cotton ball and place it in the ear. We have had results in as fast as 20 minutes. The quality of the oils make a HUGE difference. Make sure to your therapudic grade oils, that are free from synthetics or diluted with carrier oils. On our honeymoon my wife was suffering from severe ear pain and it just so happened we had lavender oil with us. She placed a few drops on a napkin and placed it on her outer ear; the treatment worked almost instantly. Thank you for the great advice. after swimming,my daughter suffered from ear ache,what medicine is suitable for her?